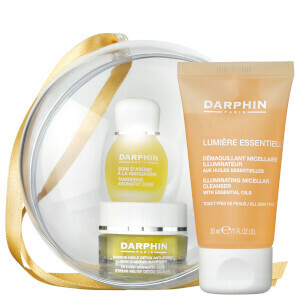 Treat your skin to the Darphin Ultimate Indulgence gift set, containing six products chosen for their powerful nourishing, hydrating and strengthening abilities. 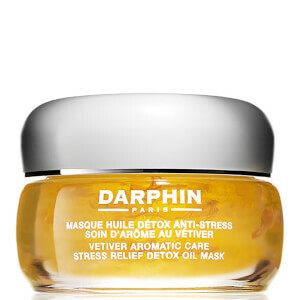 After use, the complexion will be infused with a radiant, youthful glow. Cleanser: Massage on dry skin, emulsify with water then rinse. Toner: After cleansing, apply to face and neck with a cotton pad in circular motions. Serum: Apply 3 pumps to face neck after cleansing and toning. Massage gently with fingertips in an upward motion from the inner to the outer part of the face. Eye Gel: Morning and evening, apply by gently patting on the eye contour. Gel Cream: Morning and night, massage gently onto face and neck. Nectar Oil: In the evening, apply 5 drops to face and neck with soft, circular, upward movements. Nectar Cream: Apply nightly a small amount to face and neck. Massage gently. 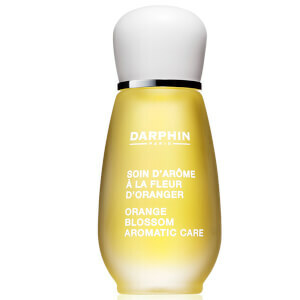 Cleanser: Caprylic/Capric Triglyceride, Octyldodecanol, Glycerin, Water\Aqua\Eau, Trimethylolpropane Triisostearate, Polyglyceryl-10 Laurate, Citrus Nobilis (Mandarin Orange) Peel Oil, Citrus Aurantium Dulcis (Orange), Flower Oil, Citrus Aurantium Dulcis (Orange) Oil, Squalane, Santalum Album (Sandalwood) Oil, Rosa Damascena (Rose) Flower Oil, Cananga Odorata Flower Oil, Butylene Glycol, Bisabolol, Tocopheryl Acetate, Butyl, Methoxydibenzoylmethane, Ethylhexyl Salicylate, Ethylhexyl, Methoxycinnamate, Citric Acid, Linalool, Limonene, Yellow 6 (Ci 15985). Toner: Water\Aqua\Eau, Pentylene Glycol, Crataegus Monogina Flower Extract, Chamomilla Recutita (Matricaria) Flower Extract, Alteromonas Ferment Extract, Ppg-26-Buteth-26, Peg-40 Hydrogenated Castor Oil, Benzophenone-4, Fragrance (Parfum), Butylene Glycol, Citric Acid, Sodium Hydroxide, Xanthan Gum, Sodium Citrate, Disodium Edta, Sodium Benzoate Red 4 (Ci 14700) Ext. Violet 2 (Ci 60730). Serum: Water\Aqua\Eau, Butylene Glycol, Glycerine, Chamomilla Recutita (Matricaria) Flower Extract, Paeonia Suffruticosa (Peony) Root Extract Alteromonas Ferment Extract, Crataegus Monogina Flower Extract, Panthenol, Glycosaminoglycans Polygonum Cuspidatum Root Extract, Saccharomyces Lysate Extract, Yeast Extract\Faex\Extrait Delevure, Peg-40 Hydrogenated Castor Oil, Cellulose Gum, Glycereth-26, Fragrance (Parfum), Citric Acid, Xanthan Gum, Disodium Edta, Chlorphenesin, Sodium Benzoate, Phenoxyethanol, Red 4 (Ci 14700) Ext. Violet 2 (Ci 60730) Yellow 5 (Ci19140) Red 33 (Ci 17200) Blue 1 (Ci 42090). Eye Gel: Water/Aqua/Eau, Tribehenin Peg-20 Esters, Octyldodecyl Stearoyl Stearate, Lauryl Laurate, Glycerin, Squalane, Propanediol, Sodium Polyacrylate, Asparagopsis Armata Extract, Ascophyllium Nododsum Extract, Malachite Extract, Geleidiellaace Rosa Extract, Imperata Cylindrica Root Extract, Cholestrol, Hypnea Musciformis (Algae) Extract, Caffeine, Sorbitol, Hydrolyzed Prunus Domestica, Artemia Extract, Laminaria Sacharina Extract, Ascobryl Glucoside, Sodium Hyaluronate, Trehalose, Pinanediol, Camphanediol, Butylene Glycol, Caprylyl Glycol, Sodium Pca, Hydrogenated Vegetable Oil, Urea, Caprylic/Capric Triglyceride, Carbomer, Sodium Hydroxide, Tocopheryl, Acetate, Xanthan Gum, Plyquaterinum-51, Fragrance (Parfum), Hexylene Glycol, Citric Acid, Sodium Citrate, Tetrasodium Edta, Bht, Phenoxyethanol, Hydroxycitronellal, Hexyl Cinnamal, Limonene, Linalool, Alpha-Isomethyl Ionone, Citronellol, Blue 1 (Ci 42090). Gel Cream: Water\Aqua\Eau, Glycerin, Dimethicone, Polysorbate 60, Cetyl Palmitate, Propanediol, Hydrogenated Polydecene, Sorbitan Stearate, Squalane, Imperata Cylindrica Root Extract, Tridecyl Stearate, Cucumis Sativus (Cucumber) Fruit Extract, Actinidia Chinensis (Kiwi) Fruit Extract, Salicornia Herbacea Extract, Lavandula Stoechas Extract, Tridecyl Trimellitate, Butylene Glycol, Tocopheryl Acetate, Dipentaerythrityl Hexacaprylate/Hexacaprate, Panthenol, Acrylates/C10-30 Alkyl Acrylate Crosspolymer, Caprylic/Capric Triglyceride, Ethylhexylglycerin, Dimethiconol, Hydrogenated Vegetable Oil, Hydroxyethyl Acrylate/Sodium Acryloyldimethyl Taurate Copolymer, Isohexadecane, Sodium Hyaluronate, Caprylyl Glycol, Sodium Hydroxide, Carbomer, Tetrasodium Edta, Sodium Benzoate, Chlorphenesin, Fragrance (Parfum), Alpha-Isomethyl Ionone, Limonene, Butylphenyl Methylpropional, Hexyl Cinnamal, Linalool, Hydroxyisohexyl 3-Cyclohexene Carboxaldehyde, Hydroxycitronellal, Citronellol, Benzyl Benzoate, Citral, Geraniol, Yellow 5 (Ci 19140), Blue 1 (Ci 42090) <Iln41642>. Nectar Oil: Simmondsia Chinensis (Jojoba) Seed Oil, Helianthus Annuus (Sunflower) Seed Oil, Oleic/Linoleic/Linolenic Polyglycerides, Persea Gratissima (Avocado) Oil, Prunus Armeniaca (Apricot) Kernel Oil, Macadamiaternifolia Seed Oil, Caprylic/Capric Triglyceride, Cananga Odorata Flower Oil, Jasminum Officinale (Jasmine) Flower Extract, Iris Pallida Root Extract, Vanilla Planifolia Fruit Extract, Phytosterols, Oxycoccus Palustris (Cranberry) Seed Oil, Brassica Campestris (Rapeseed) Sterols, Olea Europaea (Olive) Fruit Oil, Pogostemon Cablin (Patchouli) Oil, Helichrysum Angustifolium Flower Oil, Lavandula Angustifolia (Lavender) Oil, Beta-Carotene, Citrus Aurantium Dulcis (Orange) Flower Oil, Rosa Damascena (Rose) Flower Oil, Hydrogenated Vegetable Oil, Aniba Rosaeodora (Rosewood) Wood Oil, Ascorbyl Tetraisopalmitate, Phoenix Dactylifera (Date) Fruit Extract, Tocopherol, Sorbitan Oleate, Benzyl Salicylate, Limonene, Benzyl Benzoate, Farnesol, Linalool, Geraniol, Citronellol, Benzyl Alcohol, Fragrance (Parfum) <Iln43234>. Nectar Cream: Water\Aqua\Eau, Butyrospermum Parkii (Shea Butter), Simmondsia Chinensis (Jojoba), Seed Oil, Caprylic/Capric Triglyceride, Tribehenin Peg-20 Esters, Helianthus Annuus (Sunflower), Seed Oil, Macadamia Ternifolia Seed Oil, Octyldodecanol, Persea Gratissima (Avocado) Oil, Glycerin, Propanediol, Behenyl Alcohol, Copernicia Cerifera (Carnauba) Wax\ Copernicia Cerifera, Cera\Cire De Carnauba, Tapioca Starch, Citrus Aurantium Dulcis (Orange) Flower Oil, Oxycoccus, Palustris (Cranberry) Seed Oil, Olea Europaea (Olive) Fruit Oil, Aniba Rosaeodora (Rosewood) Wood, Oil, Rosa Damascena (Rose) Flower Oil, Lavandula Angustifolia (Lavender) Oil, Helichrysum, Angustifolium Flower Oil, Iris Pallida Root Extract, Jasminum Officinale (Jasmine) Flower, Extract, Rosmarinus Officinalis (Rosemary) Leaf Extract, Phoenix Dactylifera (Date) Fruit Extract, Pogostemon Cablin (Patchouli), Phytosterols, Peg-40 Hydrogenated Castor Oil, Cananga Odorata, Flower Oil, Vanilla Planifolia Fruit Extract, Ascorbyl Tetraisopalmitate, Oleic/Linoleic/Linolenic, Polyglycerides, Diethylhexyl Syringylidenemalonate, Tocopheryl Acetate, Brassica Campestris, (Rapeseed) Sterols, Ethylhexylglycerin, Tocopherol, Ppg-26-Buteth-26, Acrylates/C10-30 Alkyl, Acrylate Crosspolymer, Butyl Methoxydibenzoylmethane, Ethylhexyl Salicylate, Butylene, Glycol, Ethylhexyl Methoxycinnamate, Xanthan Gum, Carbomer, Sodium Hydroxide, Tetrasodium, Edta, Fragrance (Parfum), Phenoxyethanol, Sodium Benzoate, Farnesol, Linalool, Benzyl, Salicylate, Citronellol, Limonene, Geraniol, Benzyl Benzoate, Yellow 5 (Ci 19140), Yellow 6 (Ci, 15985). Unfortunately, Darphin disappointed me. All the products above are very basic they don’t give you the wow factor. The toner gives the same results as every other toner thus if you have a cheaper option I would go for the cheaper. The all day hydrating face and eye cream is okay, it gives the sense of hydration in a low percentage. The 8flowers face cream it smells very nice and it is very hydrating however it leaves your face dirty and it doesn’t absorb. The best product from this box was the oil; it is amazing for overnight treatment, it hydrates your face and neck and in the morning your face is brighter and nicely hydrated. I always look for a trail set from the brands to try on the product, and it's definitely worth to try. 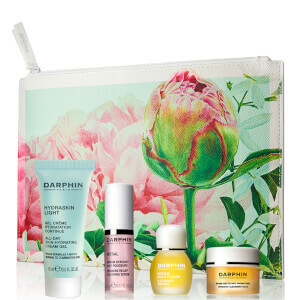 I love the pink serum as well as the oil mask.